What It’s About: When their host is murdered, six dinner guests, along with the servants, must figure out who is guilty, why they did it, and how they are all connected. Why Watch it Today? : Anthony Pratt, the creator of Cluedo (the original English title of the game) was born today in 1903. 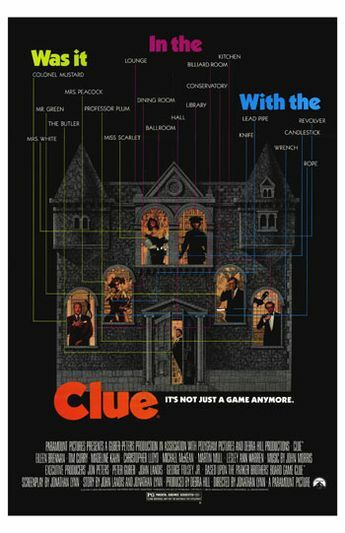 For a movie based off a relatively simple board game, Clue is more fun and amusing than it has any right to be, in large part thanks to its fantastic cast led by Tim Curry as, who else, the butler. In the theater the film had the gimmick of being released with multiple endings, to drum up interest in repeat viewings and to simulate the game itself, where the killer’s identity changes each time you play. This entry was posted in Adaptation, Based on a Board Game, Comedy, Movie of the Day, Mystery, Period Film, Spoof, The Original, Whodunnit and tagged "the butler did it", Bill Henderson, blackmail, butler, cameos, Christopher Lloyd, Colleen Camp, Communism, Debra Hill, Debra Hill Productions, dinner party, Eileen Brennan, expository rant, French Maid, gimmick, Howard Hesseman, Jane Wiedlin, John Landis, Jonathan Lynn, Lee Ving, Lesley Ann Warren, Madeline Kahn, Martin Mull, Michael McKean, multiple endings, Paramount Pictures, PolyGram, red herring, Red Scare, scientists, singing telegram, The Guber-Peters Company, Tim Curry. ← You Like us. You really Like us!